There’s magic in sitting on a curb in a city street as the sky darkens and no cars cruise along. 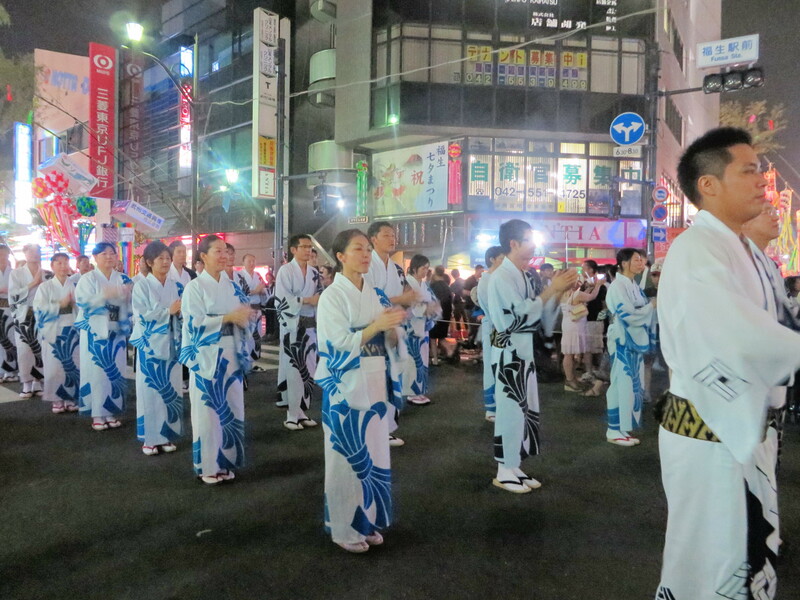 Instead, kimono-clad dancers nimbly parade by, performing traditional dances as loudspeakers blare songs in Japanese. For an hour, we sat, Wil, Liam and I, until the colorful paper lanterns and banners hanging above the street glowed with their own soft lights and the Kanji signs of the nearby shops and restaurants became sharply outlined against the dark buildings. Group after group after group passed by us. Older women in slim, pink kimonos, their simple hand motions, precise; their hops, dainty. Men in blue pajama-esque robes, with hot pink sashes tied to their backs; each man enthusiastically chopping his hands into the air. Small girls and boys, each kimono brighter than his or her neighbor, tender flowers swaying in the wind. We stretched our legs and walked away from the parade and joined the crowds milling along other nearby, closed streets. The parade would continue on for hours. 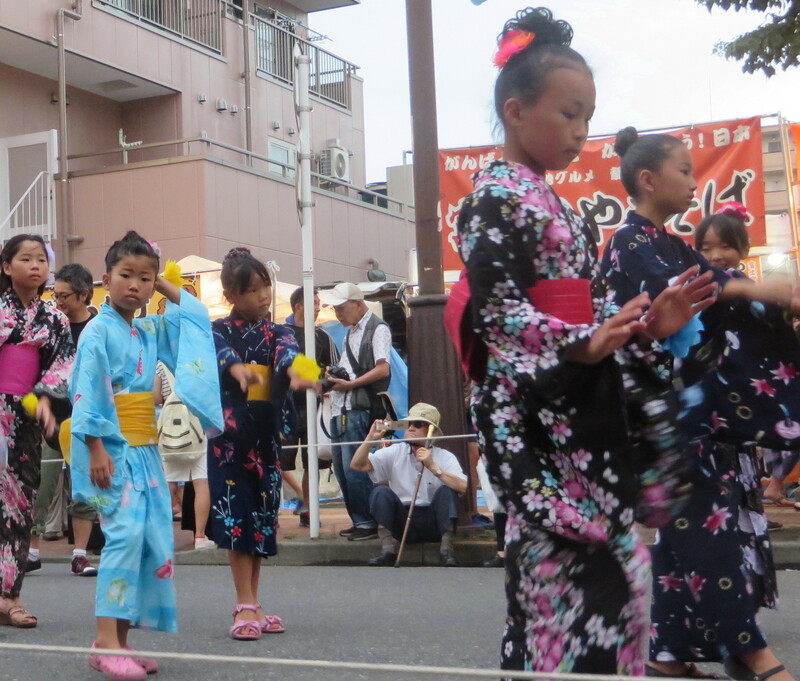 We were at our first Japanese festival, the Tanabata Festival, which took place here in Fussa last weekend. Friday night’s parade and festivities attracted thousands to the downtown neighborhoods bordering our train station. The streets were decorated from above with colorful banners and lanterns which stretched from curb to curb. Some were comprised of rows of piñata-like objects, shaped into stars or animals or Pokémon-like characters. Others were lit lanterns, their bottom edges trailing rainbow streamers onto the pedestrians below. Some had framed pictures: green aliens in kimonos. Or moving parts: a wave bouncing up and down. On one set of lanterns, I found streamers made of tiny, origami cranes folded from an array of papers. We walked the streets, shoulder to shoulder at times with the crowds, admiring the decorations and gawking at the food for sale. Vendors hawked tempura, sushi, grilled shrimp, fish and octopus and lots of little boxes of artfully placed fish and rice which I can’t begin to explain. For many, the lines snaked down half a block from the booths where chefs worked furiously to fill orders. We responded to a chef’s shout – in Japanese, of course – to try sticks of tender chicken swathed in teriyaki sauce, and did not regret our choice. The roads emptied a bit at the edges of the festival and Liam giggled in delight as he tried to leap high enough to catch onto the lantern streamers. At times he was joined by other little kids, forming teams of tiny jumpers. Groups of Japanese gathered here and there in doorways, smoking, laughing. 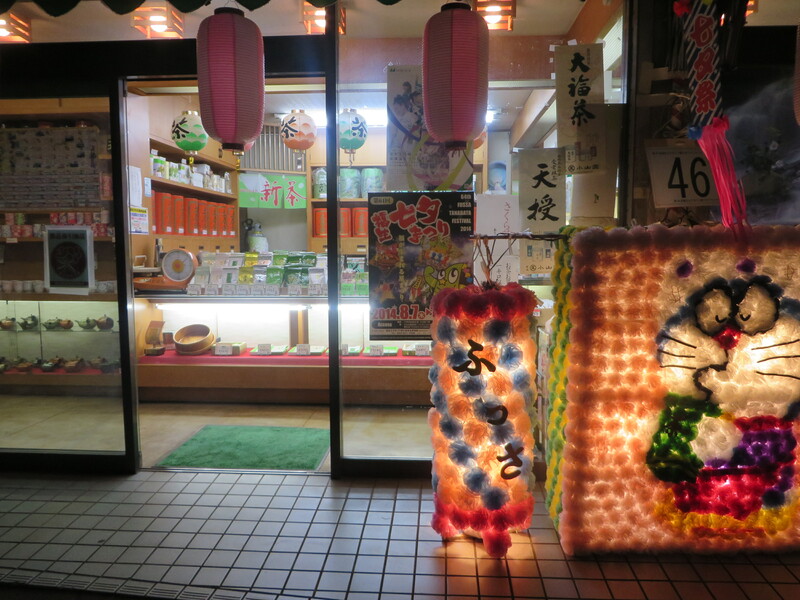 Wil and I savored the chance to walk through a part of Fussa we had yet to explore, noting little bars whose open doors showed piles of shoes and customers kneeling around low tables. The glass walls of a tea shop offered a perfect view into its well-lit interior of shelves lined neatly with teapots and boxes of tea. 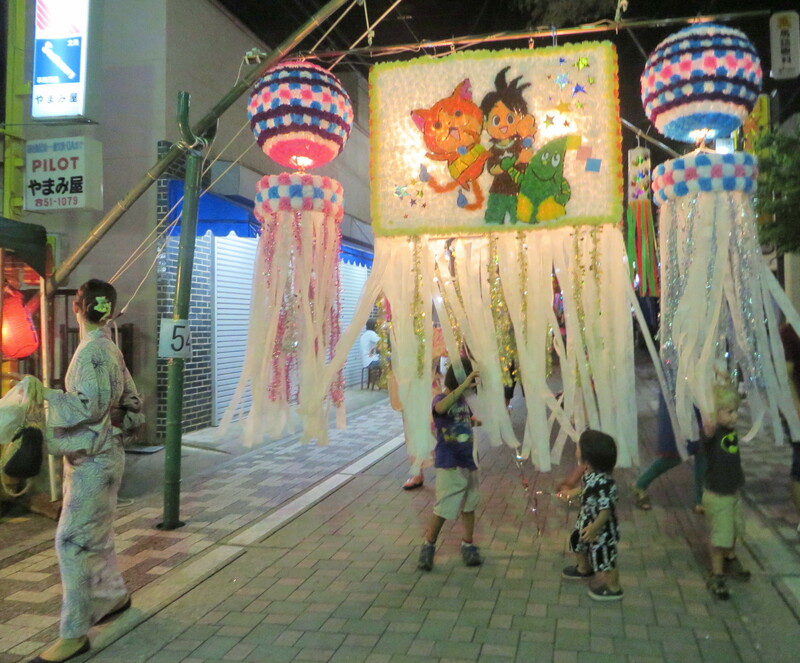 When we came home, I googled Tanabata, thinking I would collect some background information for a blog post. I must have misspelled in, because I came up empty. That’s becoming a common experience for me in Japan. I don’t speak or read the language. I have limited understanding of the culture. I may not always be able to research my way into knowing. I’m having to step back and recognize that much of what I experience here is probably just going to wash over me. I’m going to have to accept that, enjoy that. Some knowledge will come with time, as we learn the language, as we meet the locals, as the strange becomes the normal. But most likely, a lot of Japan will remain a mystery for my three years here, beautiful but unexplained. That’s going to have to be okay. I didn’t write this blog earlier because I caught a bug of some sort and spent most of the rest of the weekend sleeping. I’m healthy again and my fever long gone, but I’ve been turning and turning the festival over in my head. Who were the groups that did the dances? How did they learn them? 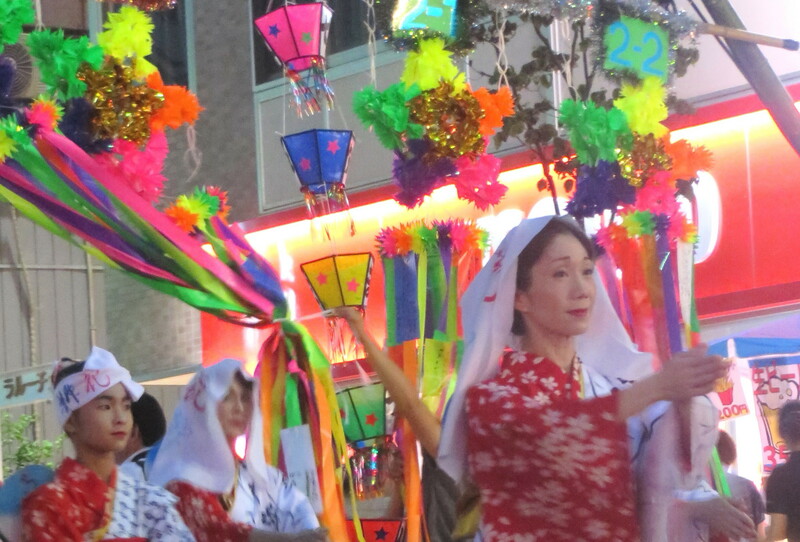 What did the Tanabata festival celebrate exactly? What did the banners represent? Each year for Tanabata, families in Japan write wishes down on colorful strips of paper and hang them from bamboo trees. I can only assume it’s a happy tradition, one filled with hope. We wish on stars for good reason, hoping some of their magic rubs off on us. I’m glad that on Friday I felt a little of that magic, even if I couldn’t quite understand what was happening. But then, what’s magic without a little mystery, right? The parade was still going strong when we left.